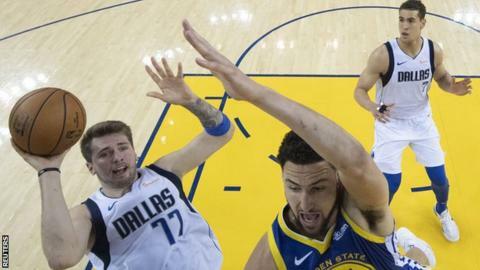 Reigning NBA champions the Golden State Warriors suffered their heaviest home defeat since 2007 in going down 126-91 at home to the Dallas Mavericks. They fell to a fourth loss this month having rested talisman Stephen Curry. According to ESPN data, it was the Warriors' worst home defeat since coach Steve Kerr was appointed in 2014 and the team's worst since 2007. Luka Doncic scored a game-high 23 points for the Mavericks, while veteran Dirk Nowitzki hit five three-pointers. The Mavericks are second-bottom in the Western Conference, while the Warriors' record is now 49 wins and 23 losses this season. However, they returned to winning ways with a 121-114 victory over Detroit Pistons at the Oracle Arena on Sunday, with the returning Curry scoring five three-pointers in his game-high 26 points. Golden State have already secured their place in the play-offs, which begin on 13 April.